What's on 4 Little Ones Australia. 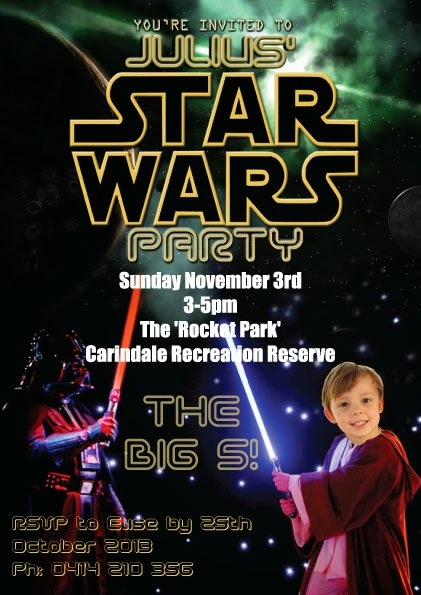 There was never any question as to what my soon to be five year old son was going to choose as his birthday party theme this year. He had become Angry Birds and Star Wars ‘obsessed’ and when the two came together in a marketers dream he was hooked! Naturally the first thing we searched together for was the cake. I had decided that every second year I would outsource the cake to a cake maker. I find it makes for a much less stressful lead up to the birthday experience and I was more than happy to have someone else create the Star Wars/Angry Birds cake as I had no idea where to start. I returned to my trusted cake maker and decorator here in Brisbane, Mommy Bakes Brisbane as she had made my daughters Peppa Pig cake last year, which was amazing. You can see that blog here. 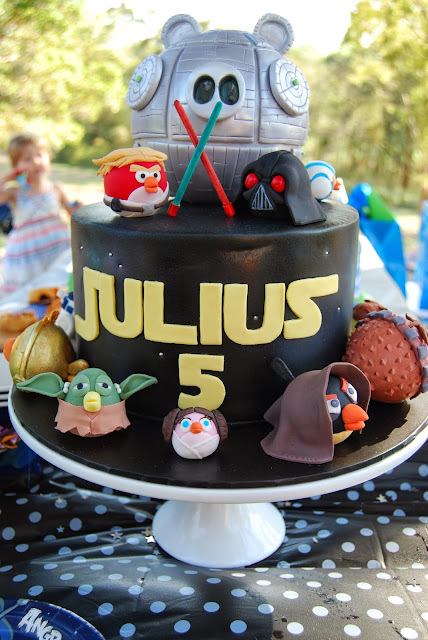 I gave Ella from Mommy Bake the basic idea that we were after a cake that incorporated Angry Birds and Star Wars and that it was to feed about 25 guests. Ella was excited about the challenge and I was relieved to hand that part of the party preparation over to her. The chocolate cake itself was divine with layers of yummy chocolate frosting. It wouldn’t be a party without a Light Saber and my clever husband got very crafty with some coloured pool noodles and black and silver electrical tape. It took about. 1.5 hours to make 15 pool noodle light sabers but it was well worth the effort. At the party we had structured games with the light sabers and then the kids had free play in the playground. They kept them well entertained for over an hour and were very safe and durable. I focused the food around Star Wars themes such as Vader Veggies, Princess Leia’s pinwhee Buns, Padawan Potatoes etc. They were a great talking point! I had cute food labels, food toppers and a banner made from Sweetheart Party Designs. These added features really helped bring the theme together. For the party favours I obviously allowed children take the light sabers home and a little sweet treat of jelly beans also made by Sweetheart party Designs. Overall it was a fantastic theme and I’m looking forward to what next year is going to bring. May the force be with you! Elise Easdown, mum of two little ones.